Very quick email response to questions was appreciated. Item looked great, just as pictured, and came with a bunch of informative material. Very satisfied with purchase! Nervous about buying online. Very happy with the product, it looks exactly like it on the website. 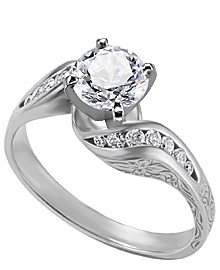 This 14k white gold diamond ring, engraved with a beautiful floral pattern, has 14 round channel set diamond side stones. Each diamond has a color of G-H and a clarity of SI. The total carat weight is .25 ct. ALSO AVAILABLE IN .50 ct.